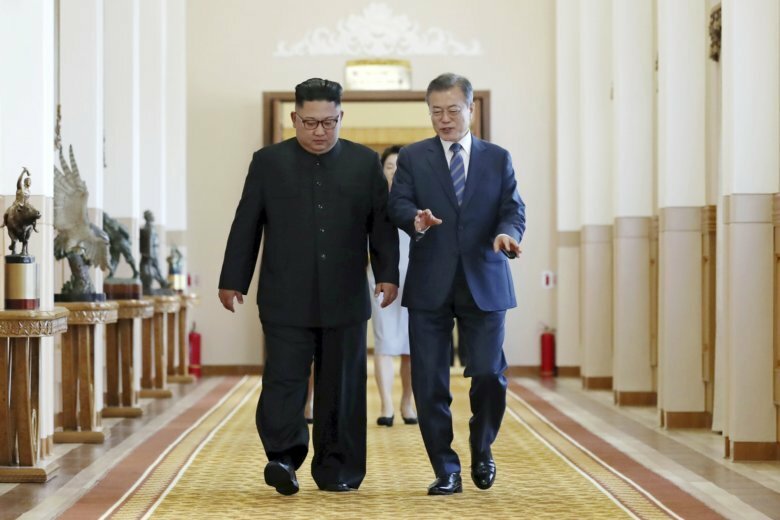 SEOUL, South Korea (AP) — The Korean leaders’ surprisingly substantive summit announcement is a huge step toward a durable peace on the Korean Peninsula — and a Nobel Peace Prize for Kim Jong Un and Moon Jae-in. No, no, it’s the death rattle of the once formidable U.S.-led pressure campaign against the North as it crumbles under the false optimism of inter-Korean engagement. Or maybe it’s just the latest empty promise from a North Korean regime famous for backstepping? How you see the third summit this year between Moon and Kim — and there could be another in the works, with Kim promising to come to Seoul soon — may depend on where you’re sitting, both geographically and politically. The view from Seoul will largely be relief, mixed with a sort of built-in wariness that many here wield as a default reaction to anything having to do with their northern neighbors. South Korea is a deeply divided place politically, with a chasm between conservatives who hate the North and liberals who want to reach out. But for Moon, whose aides have been hinting at his eagerness to secure protection from the North’s conventional weapons, this looks like a domestic win, provided the two sides can follow through. After all, much of what Moon and Kim agreed to on Wednesday — beginning to disarm their border, the world’s most heavily armed, removing land mines, setting up buffer zones to prevent accidental skirmishes and dismantling, under outside inspectors’ supervision, a North Korean missile launch pad — could tangibly improve South Koreans’ safety. The two Koreas have had multiple bloody naval clashes along their disputed sea border. In 2010, a torpedo attack blamed on the North killed 46 South Korean sailors, followed several months later by a North Korean artillery attack that killed four South Koreans, including two civilians, and prompted a South Korean return strike. South Koreans are famous for their ability to keep calm and carry on in the face of North Korean belligerence, but it would be a mistake to think there isn’t concern — and a clear recognition of the potential danger — when animosity rises. About 25 million people live in the greater Seoul area, which is in easy artillery range of the nearby border. And while South Koreans mostly ignore North Korea’s vows to turn Seoul into a “sea of fire,” they also know that it could technically be done, more or less; the first time Pyongyang made that now-common threat, in 1994, it caused panic in Seoul. Many here will wisely reserve judgment on whether the South Korean president’s lofty claim to have removed “every threat” of war is correct — recent Korean history is littered with grand-sounding rhetoric that dissolved in the winds of the rivals’ enmity — but if Moon and Kim can pull off what they’ve agreed to this week, there could be an outbreak of that rarest of feelings when it comes to inter-Korean ties: optimism.